I think that there are THREE key ingredients to a really good conference – location, content and the people. So I am really excited to be able to talk about DevFest 2014 on Saturday 6th December (which definitely has all of them). 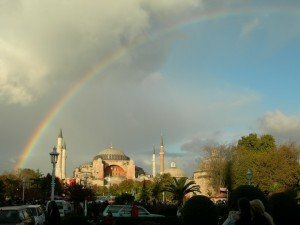 If you read my write-up about DevFest 2013, you will know that I was really impressed with the first technical conference organised in Istanbul. This was a multi-track conference organised under the ‘Google’ brand by a group (well it looked more like an army to me) of very passionate, extremely articulate volunteers in Istanbul. There were talks in English and Turkish and attendees from as far away as New York. There were multiple tracks with packed sessions on web, server, desktop, network and it all ran exactly to time. The whole thing had an amazing energy and excitement. I asked them very nicely if they would consider letting me come back if they ran the conference again. So this year, it is bigger and better. There is a new location in the Asian part of Istanbul (Istanbul is a city spanning two continents). There are FIVE tracks running across a single saturday with 42 speakers. Your biggest problem might be choosing which talk to attend….. I will be doing a talk called ‘5 reasons why NetBeans IDE should be in every developers toolkit’ giving you a detailed tour of NetBeans features (and you thought it was just an IDE for just Java Developers) and how we use it at IDRsolutions to develop our PDF and HTML5 libraries. I know there is at least one other NetBeans tutorial session about using NetBeans for development by someone from Oracle (I will let him reveal all on his blog). I also know that our friends from EPIK are organising a MineCraft coding event as part of DevFest (register here). So if you have children who might be interested in hacking MineCraft or learning coding, you can make it a family day out. There will also be talks on every web and computer topic you can imagine (Dart, JS, Android, HTML, Java, frameworks, etc) and a Hackathon. There is also an exhibition of IT Companies. I will have a stand there for IDRsolutions so come and talk to me about NetBeans, Java, PDF, HTML5 (or even Iconclasm in the Byzantine state). Istanbul (formally Byzantium) is one of the most amazing cities in the world packed with thousands of years of History – fabulous gems, Roman forum, Egyptian and Greek statues, religious relics, castles, palaces, churches, mosques, underground cisterns. And even a population of kittens…. You can see my pictures from last year here. I spent 4 years studying History for my MA Degree at St. Andrews University and this is my specialist subject, so I feel I can speak with authority on this topic! I will be site-seeing on Sunday if you want to tag along (I have a lot to fit in so early start). So are you going to be there? Details of DevFest are already starting to appear on the DevFest website (http://devfesttr.com/) and will be updated regularly the next few weeks. You can register for your free ticket now. I have been to many conferences and this is my favourite. Lots of great content, amazing people and I get an excuse to spend the weekend in an amazing city. Drop me a line if you still need persuading…. Does netbeans support a T1/UNE-L there? I am sorry but I do not personally know what a T1/UNE-L. If you can enlighten me I will try to answer (or chase up one).